This enchilada casserole offers all the flavors of enchiladas without the tedious effort of rolling them. 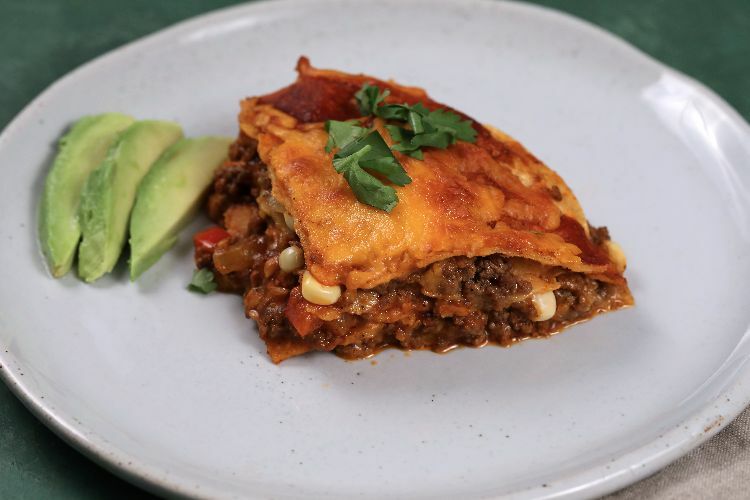 You can use ready-made enchilada sauce with great results, but you can also make it with the recipe provided if you are feeling adventurous. The casserole builds on the classic enchilada flavors by adding red bell pepper and corn. Feel free to substitute the beef with ground chicken or two 15-ounce cans of black beans to suit your palate. 1. Heat oil over medium heat in a large sauté pan until shimmering. Add the ground beef, breaking up with the back of a wooden spoon. Cook until browned and fully cooked, about 8 to 10 minutes. Add the onion and garlic and cook until soft, about 3 to 4 minutes. Add the bell pepper, corn, salt, oregano, cumin, chili powder and black pepper and cook until softened, about 4 to 5 minutes. Remove from the heat. 2. To assemble casserole, start with a layer of enchilada sauce on the bottom of an 9-inch by 13-inch dish. 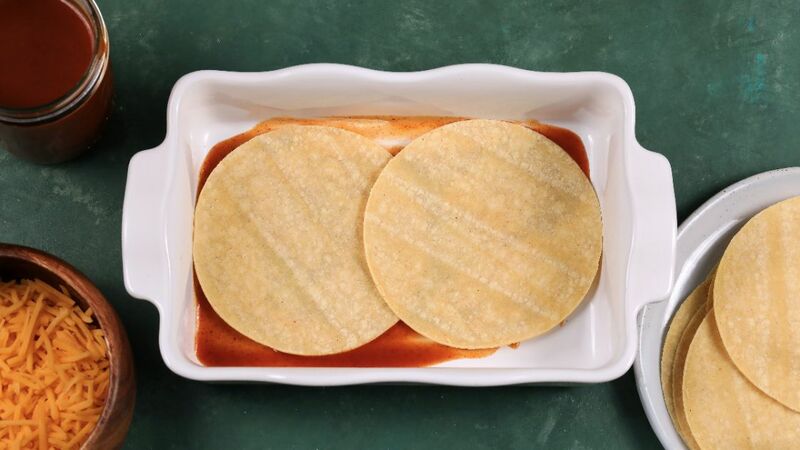 Lay tortillas in an even layer over the sauce. Add a layer of beef and cheese and then another layer of enchilada sauce. Repeat until all tortillas, beef and cheese are used, about four to five layers. Top with a final layer of tortillas, enchilada sauce and cheese. 3. Bake in the oven at 350 degrees Fahrenheit for 25 to 30 minutes, until cheese is melted and casserole is bubbling. 4. Garnish each serving with avocado slices and cilantro. 1. Heat the oil in a saucepan on medium heat until shimmering. Add the flour and chili powder and stir. Cook until the bright red color turns darkens, stirring frequently. 2. Meanwhile, mix the tomato sauce, broth, garlic powder, onion powder and salt in a small bowl until combined. Add to the saucepan and whisk until fully incorporated. Cook for 8 to 10 minutes on medium heat until thickened. Note: The enchilada sauce can be made in advance. It lasts in the refrigerator for up to 1 week in an airtight container. Every bite of this classic favorite has the perfect balance of flavors.